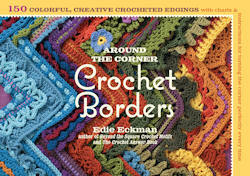 Around the Corner: Crochet Borders presents 150 crochet borders along with everything you need to work around corners. Edie presents how to work into edges of crocheted, knitted, woven, and felted fabrics, how to work a flat edge, how to calculate the number of stitches along an edge, and more. Each pattern provides the base round stitch counts, the pattern in both words and symbols, and the pattern variation for working along a straight edge. Interspersed among the pages are tips and notes to help as needed. When designing items, I find that deciding on a border is the hardest part for me, especially if I have to work around corners. This book makes it easier to figure out and turn out some spectacular borders.